President Donald Trump has criticized two Central American nations supporting his stance on the political crisis in Venezuela, where the United States and a number of regional allies have recognized an opposition leader as acting president. At a press briefing Friday, Trump reiterated his support for a border wall project that has polarized the country's political atmosphere, prompting the longest government shutdown in U.S. history as Republicans and Democrats failed to agree on a spending bill for nearly five weeks, until a temporary compromise was reached last month. Trump has argued that the wall would stem the flow of undocumented immigration, especially from Latin America—a region with an extensive history of U.S. intervention. Trump railed against Mexico, calling it "the most unsafe country in the world" and went on to attack Central America, from where migrants have fled crime and poverty in caravans attempting to enter the U.S. Some have been met with a militant response at the border a the Trump administration enforces its hard-line on immigration. "We need a protective barrier in our country," Trump said. "And that doesn't include Honduras, who we are not happy with and we're looking very serious at taking away all funding, and the same thing for Guatemala, and the same thing for El Salvador. It's a disgrace what's going on in these countries. For years and years, the United States has paid them hundreds of millions of dollars and they do nothing for us." Dear Donald: especially China, and possibly Russia, are taking note of your intentions and will be very happy to replace the missing financial support for getting some favours back instead. CARACAS, Venezuela — Calls from world leaders were piling up. The prime minister of Denmark was trying to reach him. So, too, was Justin Trudeau. But Juan Guaidó, the young Venezuelan lawmaker leading an effort to topple the country’s authoritarian government, did not appear to be in a hurry to speak with them, as he held the hand of a woman whose son had been gunned down by security forces during a recent nighttime demonstration. “This can’t be in vain,” Mr. Guaidó told the mother, Ana Cecilia Buitrago, on Sunday morning as tears welled up in his eyes. Mr. Godoy’s death came a few days after Mr. Guaidó, the head of Venezuela’s National Assembly, formally launched an audacious bid to force Nicolás Maduro out of the presidency, arguing that Mr. Maduro had “usurped” power by taking office on Jan. 10, following an election that was broadly seen as rigged. Since then, Mr. Guaidó, a lanky 35-year-old, has spent long days working to shore up his support abroad while leveraging his escalating public support at home to get government insiders, in particular military leaders, to turn on Mr. Maduro. While it’s still far from certain that Mr. Guaidó will ever set foot in the presidential palace, the number of ordinary Venezuelans and foreign powers taking his side is growing. 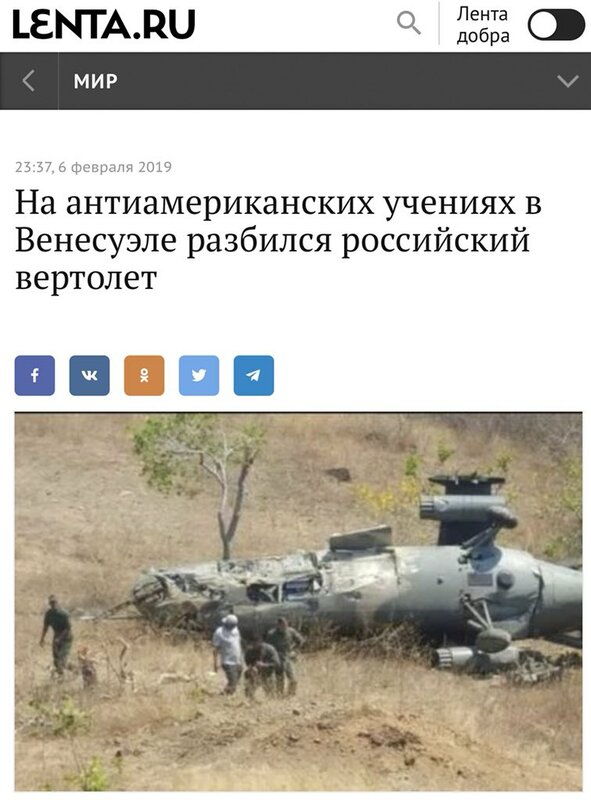 #Russia’s media cites Venezuelan media reports that a Russian helicopter “crashed during anti-American exercises” in #Venezuela. And dotus is ignorant of current history including the more recent past upto WW1. He ever cracked a book or studied history, who knew???? CARACAS, Venezuela —Venezuelan opposition leader Juan Guaidó set Feb. 23 as the deadline for humanitarian aid to enter the country as his supporters Tuesday filled streets nationwide. Speaking before masses of supporters, Guaidó said he is mobilizing caravans to get the badly needed food and medicine from across the border in Colombia. He also announced a second collection of aid across the border in Brazil. CARACAS, Venezuela (AP) — President Nicolas Maduro said in an AP interview Thursday that his foreign minister recently held secret talks in New York with the U.S. special envoy to Venezuela, even as the Trump administration was publicly backing an effort to unseat the Venezuelan president. While harshly criticizing Donald Trump’s confrontational stance toward his socialist government, Maduro said he holds out hope of meeting the U.S. president soon to resolve a crisis over America’s recognition of opponent Juan Guaido as Venezuela’s rightful leader. “If he wants to meet, just tell me when, where and how and I’ll be there,” Maduro said without providing more details. He said both New York meetings lasted several hours. Venezuelan Army Releases Video of ‘Intense Training’ to ‘Scare Off’ U.S. Military Forces. It Fails. The U.S. Air Force has begun flying tons of aid to a Colombian town on the Venezuelan border as part of an effort meant to undermine socialist President Nicolas Maduro. Trump is in Florida now holding a rally with Venezuelans. Taking opportunity to bash socialism. Pres. Trump says embattled Venezuelan Pres. Nicolas Maduro is a "Cuban puppet." Luckily, Venezuela isn't on the shores of the Gulf of Mexico. Venezuelan President Nicolás Maduro announced Thursday he is closing the country's border with Brazil amid tensions over foreign aid deliveries to the embattled country. Maduro announced the Brazil closure on state television and threatened to close the border with Colombia as well, according to a report by the The Associated Press. Tensions between Venezuela and its two largest neighbors have flared since last month, as Colombia and Brazil followed the United States' lead in recognizing opposition leader Juan Guaidó as Venezuela's legitimate interim president. Brazil, once seen as one of Venezuela's allies in the region, has taken a stronger stance on Maduro since the inauguration of President Jair Bolsonaro in January. But Brazilian authorities have warned against foreign intervention in Venezuela, in part because of the Brazilian state of Roraima's energy dependence on its northern neighbor. CARACAS, Venezuela — A former intelligence chief in Venezuela who is one of the government’s most prominent figures turned against President Nicolás Maduro on Thursday, calling him a dictator with a corrupt inner circle that has engaged in drug trafficking and courted the militant group Hezbollah. In interviews with The New York Times, the former intelligence chief, Hugo Carvajal, 58, who is a congressman in the governing Socialist Party, urged the military to break with the president ahead of a showdown with the opposition on Saturday over Mr. Maduro’s blockade of aid shipments on the country’s borders. The strong words come amid a wave of other defections by government officials, including a top air force official, diplomats, military attachés and members of the national guard. This break with the regime, by a man who once guarded its secrets as intelligence chief, adds a dose of unexpected pressure on the president just three days before the confrontation over aid at the border with Colombia. LISBON (Reuters) - The crew of Venezuelan oil tanker, the Rio Arauca, that has been stuck in the middle of the river Tagus in Lisbon for nearly two years due to unpaid debt, is set to be dismissed, managers Bernhard Schulte Shipmanagement (BSM) said on Thursday. BSM also said in a statement sent to Reuters another Venezuelan tanker, the Parnaso, which is in dry dock at the port of Setubal, south of Lisbon, will also have its crew removed later this week due to a lack of payment from owners PDV Marina, a subsidiary of Venezuela’s state-owned oil company PDVSA. Various tankers with Venezuelan crude around the world have been arrested by authorities or otherwise prevented from leaving because PDVSA has not been able to pay for hull cleaning, inspections, and other port services. SAN CRISTOBAL, Venezuela — Venezuelan soldiers opened fire on a group of civilians attempting to keep open a segment of the southern border with Brazil for deliveries of humanitarian aid, causing multiple injuries and the first fatalities of a massive opposition operation meant to deliver international relief to this devastated South American country, according to eyewitnesses and community leaders. At 6:30 a.m. on Friday, a military convoy approached a checkpoint set up by an indigenous community in the southern village of Kumarakapay, on the main artery linking Venezuela to Brazil. Venezuelan President Nicolás Maduro on Thursday ordered the closure of Venezuela’s border with Brazil. When the opposition supporters sought to block the military vehicles by standing in front of them, soldiers began firing assault rifles. At least two people were killed and a dozen wounded, at least three of them seriously. The dead were named as a woman, Zorayda Rodriguez, 42, and a man, Rolando Garcia. Footage posted online shows the soldiers requesting help from the Colombian migration agency to cries of "freedom" and "put down your arms." Mr Guaidó told reporters that humanitarian aid was on its way to Venezuela, in a "peaceful manner." "Welcome to the right side of history", he told soldiers who had abandoned their posts, adding that soldiers who joined them would be guaranteed "amnesty." Earlier he had urged the military to allow aid trucks to enter, calling on Venezuelan soldiers to "put themselves on the side of the people". Three soldiers abandoned their post at this bridge by crossing into Colombia, while another did so at the Paula Santander International Bridge in Ureña, in south-west Venezuela. A video posted on social media appears to show four soldiers publicly denouncing Mr Maduro and announcing their support for Guaidó. WASHINGTON (Reuters) - U.S. Vice President Mike Pence plans to meet with Venezuela’s opposition leader Juan Guaido in Bogota on Monday on the sidelines of a meeting of the Lima Group of regional leaders, a Pence aide said on Saturday. 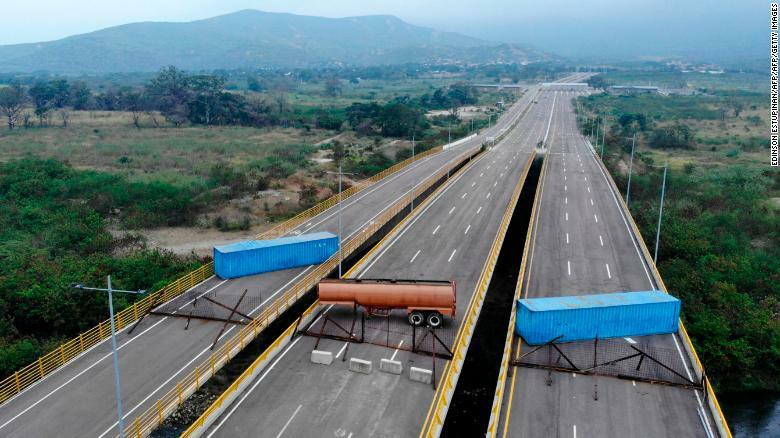 The meeting comes after troops loyal to Venezuela’s President Nicolas Maduro blocked convoys of U.S. humanitarian aid from crossing the border on Saturday, and is aimed at showing continued U.S. support for Guaido, who most Western nations recognize as Venezuela’s legitimate leader. US vice-president Mike Pence has repeated a veiled threat of military intervention in Venezuela, but Washington appeared increasingly isolated in its willingness to contemplate using force to oust President Nicolás Maduro. Both European powers and some of Donald Trump’s key Latin American allies – all of whom have recognised opposition leader Juan Guaido as Venezuela’s legitimate leader – warned that they would oppose sending troops into the country. New York (CNN Business)The Univision network says six of its staffers, including veteran anchorman Jorge Ramos, are being detained at the presidential palace in Caracas, Venezuela. The network said Ramos was there to interview embattled Venezuelan President Nicolas Maduro. "Attention: A @Univision team, headed by @jorgeramosnews, is being arbitrarily detained at the Miraflores Palace in Caracas," the network tweeted out on Monday evening. Univision is the leading Spanish-language television network in the United States, with millions of loyal viewers. The network contacted the US State Department shortly after the incident. Kimberly Breier, the Assistant Secretary of State for Western Hemisphere Affairs, tweeted out, "We insist on their immediate release; the world is watching."